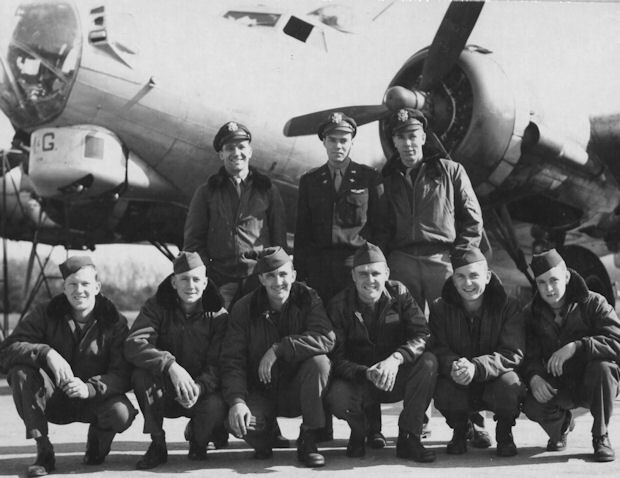 Members of the Lt Burton crew flew on four combat missions (Except as noted). #364 - 25 April 1945 to Skoda Armament Works, Pilsen, Czechoslovakia (303rd BG(H) last combat mission). One 303rd BG(H) B-17 shot down. 2Lt Richard B. Burton (P) - Flew his first three missions as CoPilot with Lt Walter W. Kamstra as Pilot. Lt Kamstra was a member of the Lt Morton C. Perkins. Crew assigned 358th BS on 2 Feb 1945. Flew 23 combat missions. Missions with the Burton Crew were his first after being upgraded from CoPilot to Pilot. F/O Clyde W. Brough (Nav) - Did not fly on mission #360. Substitute Navigator was F/O Julius Leonhirth who was assigned to the 358th BS on 19 Dec 1945 as the 2Lt Donald R. Walter Crew Navigator. F/O Leonhirth flew on 33 combat missions, first four with the Walter Crew. Lt Walter was made a Lead Crew Pilot and F/O Leonhirth then flew as a substitute Navigator with 14 different Pilots and crews. 2Lt Harold K. Ludlow (CP) - Flew only on mission #364 with the Lt Burton Crew. Sgt Alexander L. Blondeau (Tog), T/Sgt Cecil J. King (Eng), Sgt Edward P. Salm (Rad), Sgt Harmon E. Amos (BTG), Sgt Everette E. Strahan (TG) flew on all four of the Lt Burton Crew missions. Cpl Lewis G. Nance (WG) - Removed from the Lt Burton Crew before the crew's first combat mission. The Waist Gunner position had been deleted from 303rd BG(H) crews. Flew no 303rd BG(H) combat missions.